And the countdown begins! We are just shy of twelve hours on our Eclipse 2017 countdown. Yes this is a big event and some people are taking it as a rare, once-in-a-lifetime opportunity. The fact about eclipse’s is that they occur roughly every eighteen months yet knowing where the path of totality will cross during and eclipse is what makes this one so special! It’s been 38 years since North America was on the path of totality so even though many of us have to travel a few, if not many, miles to reach a spot where totality will occur, it is definitely going to be worth the trip. I live in Chicago which is not in the path of totality and I have seen a few partial eclipses but never a total eclipse. I’m sure our tourist office would be a lot happier if Chicago got more than 87% coverage but still that’s a pretty good partial eclipse. I never realized that living in the Midwest would one day yield such a treasure as not just one but two total solar eclipses. If you missed this one, 2024 will offer up the same show and in the same location. If you are in Illinois, Carbondale is on the path of totality for both the 2017 and 2024 total eclipses. Below is a cool interactive path of totality map that you can use to see how much of the eclipse you will see. Great for teaching longitude and latitude! 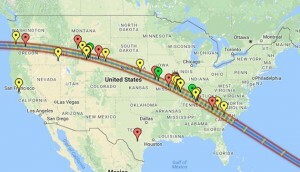 Click on the image to go to the NASA Eclipse page and the interactive map. The science is incredible as there is so much that can be observed, learned, and used to teach everybody about the Sun/Earth connection as well as lots of cool facts about our Moon. Wherever you may be, DO NOT LOOK at the eclipse without a pair of safety rated eclipse glasses. The radiation from the Sun during the partial eclipse can damage your eyes. The same for cameras. DO NOT TAKE PICTURES ON A CAMERA WITHOUT A SOLAR FILTER. This includes cell phone cameras too. The only time it is safe to look at the Sun without eclipse glasses is during the two or so minutes during totality which is a sight to behold. Capturing the eclipse on camera is a great way to remember the event but remember that capturing with a camera takes away from the experience. (I learned that during my first shuttle launch). The eclipse will be streamed, live on the Web, and captured by NASA satellites and missions so put down the cameras and look up! You can catch the whole show in re-runs. Safe travels and safe eclipse viewing!